Few days ago my colleague and a friend Max wrote a piece about Wind to hydrogen possibility. It was an interesting article. It got me thinking about other possibility so in this post, I am going to write some different ways of creating energy and storing through Wind/Solar. Hybrid power describes the combination of a power producer and the means to store that power in an energy storage medium. 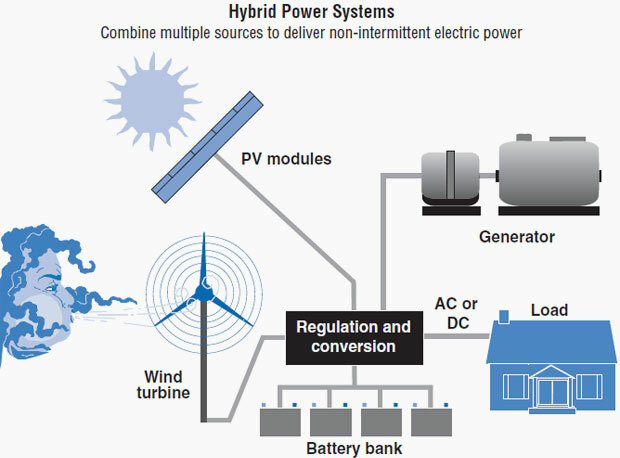 In power engineering, the term ‘hybrid’ describes a combined power and energy storage system.Hybrid systems, as the name implies, combine two or more modes of electricity generation together, usually using renewable technologies such as Solar Photovoltaic (PV) and wind turbines. Hybrid systems provide a high level of energy security through the mix of generation methods, and often will incorporate a storage system (battery, fuel cell) or small fossil fueled generator to ensure maximum supply reliability and security. As you can see it from the image above. From coal usage we generate almost 50% pf pollution so using Wind energy is very very sustainable. Let’s look at various like of Hybrid Power Systems.There are five kinds of Hybrid Power system. We will see a brief overview of each hybrid system. 1) Wind-Hydro System – It generates electric energy combining wind turbines and pumped storage. Wind-hydro stations dedicate all, or a significant portion, of their wind power resources to pumping water into pumped storage reservoirs. These reservoirs are an implementation of grid energy storage. 2) Wind-Hydrogen System – One method of storing wind energy is the production of hydrogen through the electrolysis of water. This hydrogen is subsequently used to generate electricity during periods when demand can not be matched by wind alone. The energy in the stored hydrogen can be converted into electrical power through fuel cell technology or a combustion engine linked to an electrical generator. 3) Wind-Diesel System – A wind-diesel hybrid power system combines diesel generators and wind turbines, usually alongside ancillary equipment such as energy storage, power converters, and various control components, to generate electricity. They are designed to increase capacity and reduce the cost and environmental impact of electrical generation in remote communities and facilities that are not linked to a power grid. Wind-diesel hybrid systems reduce reliance on diesel fuel, which creates pollution and is costly to transport. 4) Wind-compressed air systems – At power stations that use compressed air energy storage (CAES), electrical energy is used to compress air and store it in underground facilities such as caverns or abandoned mines. During later periods of high electrical demand, the air is released to power turbines, generally using supplemental natural gas.Power stations that make significant use of CAES are operational in McIntosh, Alabama, Germany, and Japan. System disadvantages include some energy losses in the CAES process; also, the need for supplemental use of fossil fuels such as natural gas means that these systems do not completely make use of renewable energy. 5.1) Wind-solar building – The Pearl River Tower in Guangzhou, China, will mix solar panel on its windows and several wind turbines at different stories of its structure, allowing this tower to be energy positive. 5.2) Wind-solar lighting – In several parts of China, there are lighting pylons with combinations of solar panels and wind-turbines at their top. This allows space already used for lighting to be used more efficiently with two complementary energy productions units. 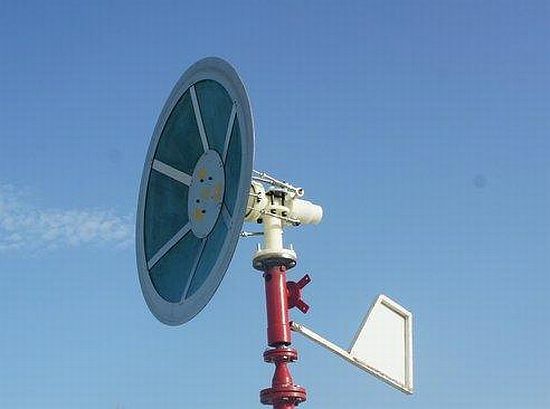 Most common models use horizontal axis wind-turbines, but now models are appearing with vertical axis wind-turbines, using a helicoidal shaped, twisted-Savonius system. If I missed some kind of Hybrid Power system, you are welcome to comment or suggest further. ← Wind-to-Hydrogen: A possible solution to store energy?